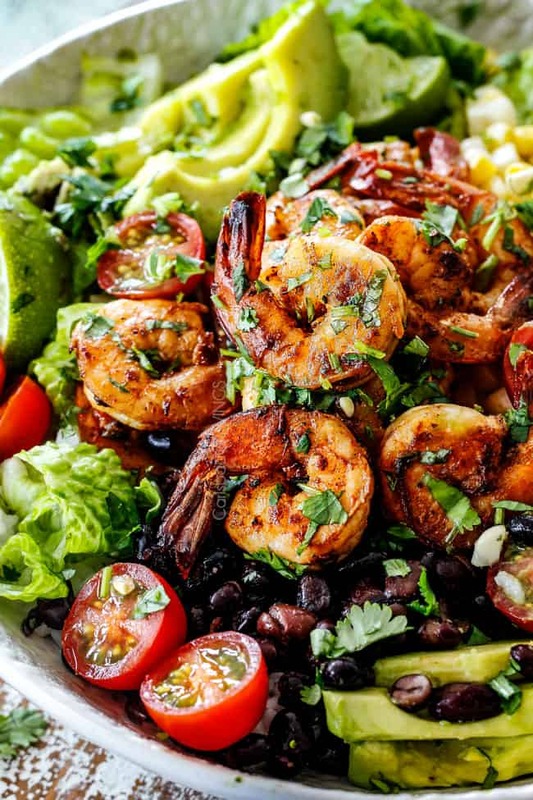 30-minute Chipotle Lime Shrimp Burrito Bowls are healthy, quick and easy and loaded with all your favorite burrito fixings! 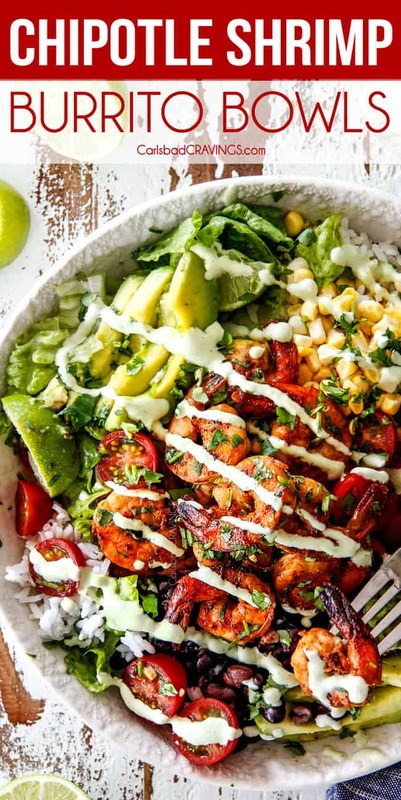 These Shrimp Burrito Bowls are piled with juicy shrimp, tomatoes, avocados, black beans, corn and rice, then drizzled with tantalizing Cilantro Lime Dressing. You can serve the Chipotle Shrimp as suggested Burrito Bowls or transform them into a salad, wrap or burritos! These burrito bowls make fabulous prep ahead lunches or dinners! I am sooo excited to introduce you to these Chipotle Lime Shrimp Burrito Bowls as the latest addition to my quick, easy dinners but more excited to introduce you to the author of the recipe, Mary Younkin, creator of the blog BarefeetInTheKitchen.com. 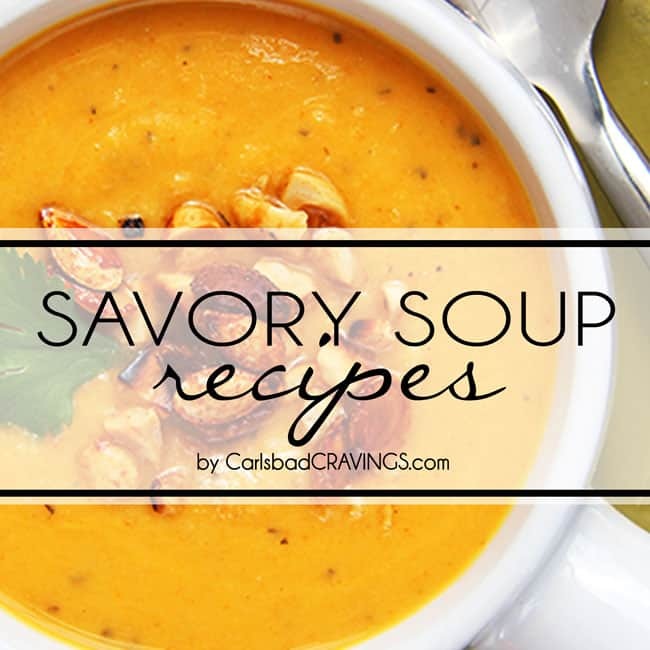 Mary is a dear friend of mine who is not only warm, kind and generous, but she has the best recipes! 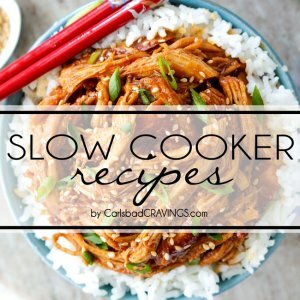 So if you are look to simplify your life and eat deliciously, then you need this cookbook in your life! Burrito Bowls, taco bowls, Buddha bowls, any type of bowls have to be my absolute favorite meal. The delectable rainbow of flavors and textures in each and every bite is nothing short of swoon worthy. And then there is the shrimp. Don’t you just love shrimp? 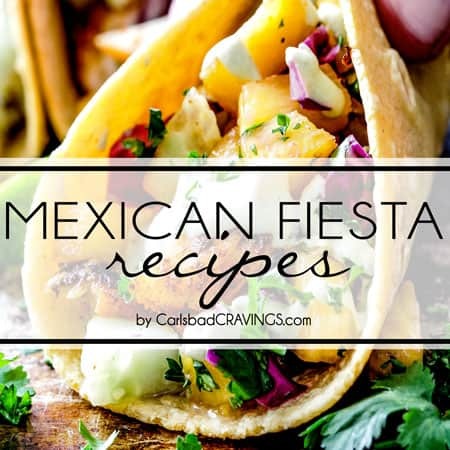 It is so quick and easy and the king of 30 Minute Meals from Sheet Pan Shrimp Scampi to Lemon Garlic Shrimp Fettuccine to Cilantro Lime Shrimp Tacos with Mango Salsa. 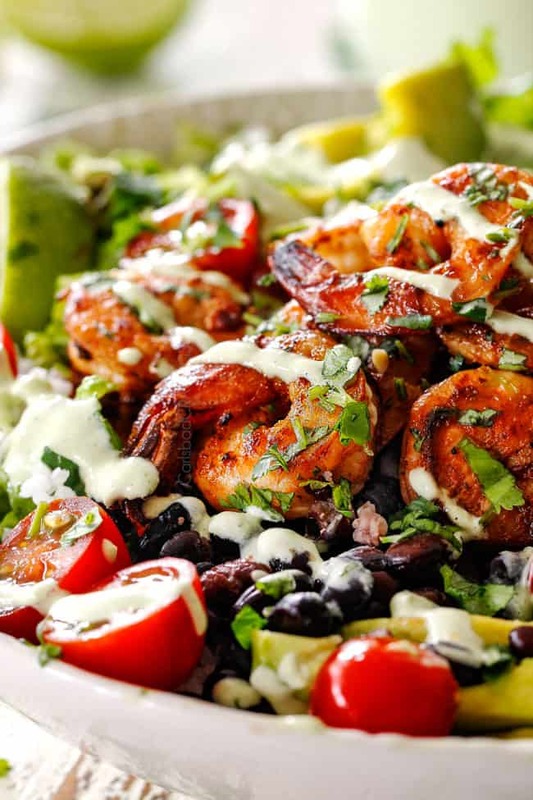 Shrimp takes center stage in these burrito bowls. 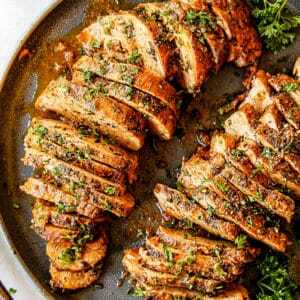 It is wonderfully juicy and flavorful from a 15 minute marinade of chipotle peppers, honey, lime, garlic, and cumin. 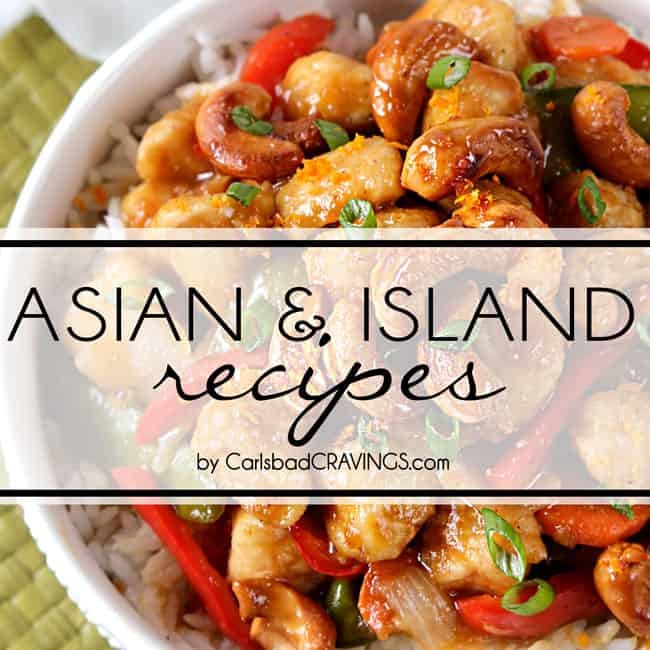 I love how quick shrimp is to work with but you can easily substitute chicken as well. 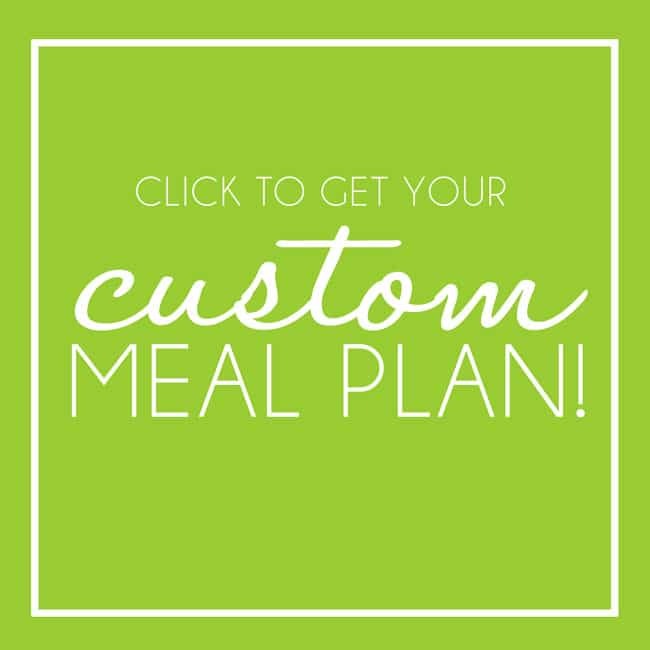 You will also love how the bowl ingredients are completely customizable! The other key elements to these Burrito Bowls is something creamy to marry all the different textures together – even if it’s just a drizzle. 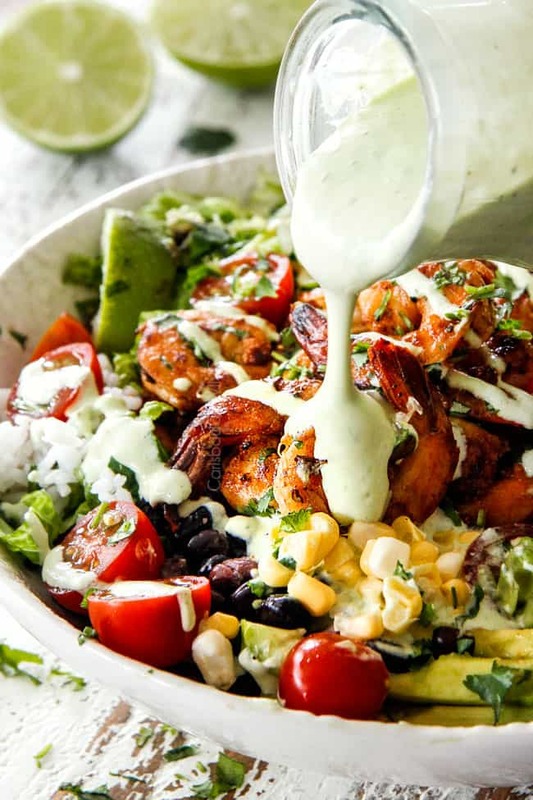 For these Shrimp Burrito Bowls, you can use Greek yogurt, sour cream, store bought Avocado Ranch (or my homemade), but if you want the best Shrimp Burrito Bowls ever, then I highly suggest my lusciously creamy, tangy, punchy Cilantro Lime Dressing. pure magic. HOW DO I DEFROST SHRIMP FOR burrito bowls? 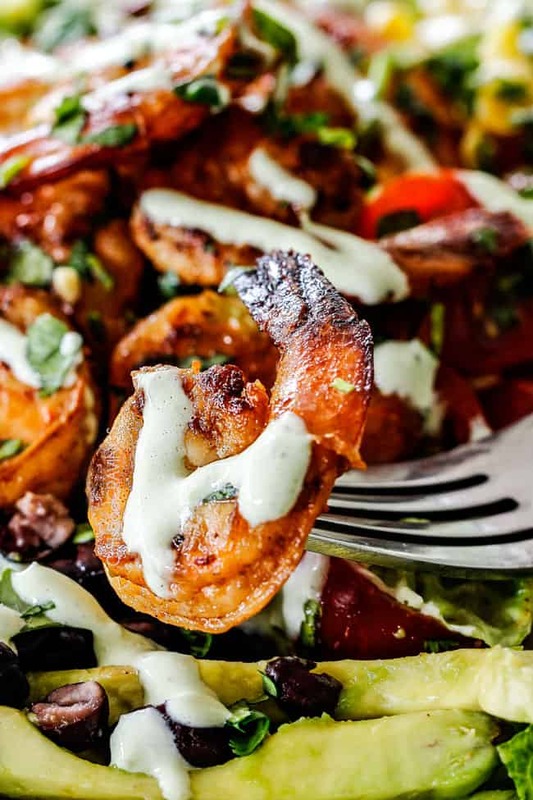 You are going to want to use defrosted, raw shrimp for these Shrimp Fajitas. I like to buy my shrimp by the frozen bagful at Costco because they come shelled and deveined so all that’s left to do is thaw the shrimp. Also, if you keep frozen shrimp on hand, then you can make these Shrimp Burrito Bowls at a moments notice. To quickly defrost, place the frozen shrimp in a fine-mesh sieve or colander. Place this sieve in a large bowl of cold tap water for 10 minutes. After 10 minutes, replace the water in the bowl with new cold tap water and resubmerge the shrimp. Let shrimp sit an additional 10- 20 minutes. At this point the shrimp should be completely defrosted. The easier way to defrost your shrimp – if you remember in advance – is to remove your frozen shrimp to a covered bowl and let them defrost in the refrigerator overnight. 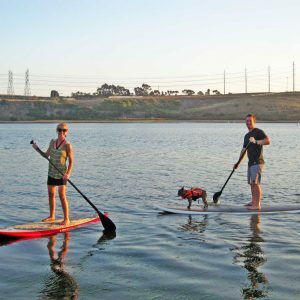 What are Chipotle Peppers in Adobo Sauce? This Shrimp Burrito Bowl recipe calls for 1-2 chipotle peppers in adobo sauce, finely minced. If you have been following me for any time at all, you know I love chipotle peppers and often use chipotle chili powder in my Mexican dishes and even my barbecue sauces. You can easily find canned Chipotle Peppers in Adobo Sauce in the Latin section of any grocery store. The name “Chipotle pepper” comes from the Nahuatl word chilpoctli meaning “smoked chili”. Chipotle peppers are smoke-dried jalapenos preserved in adobo sauce. 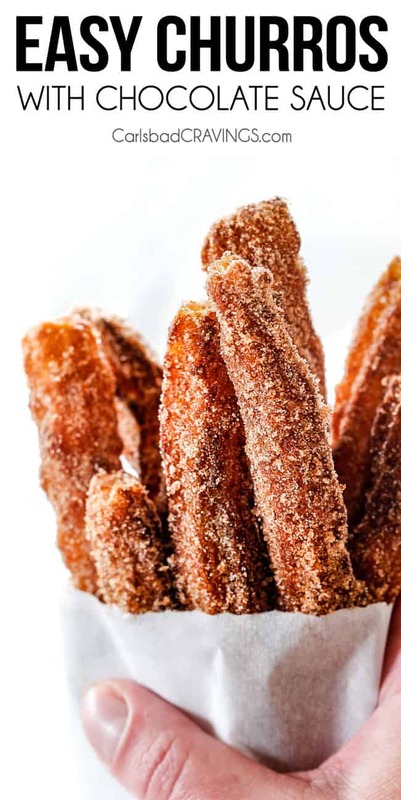 They have a distinct, smoky, spicy, slightly sweet flavor. 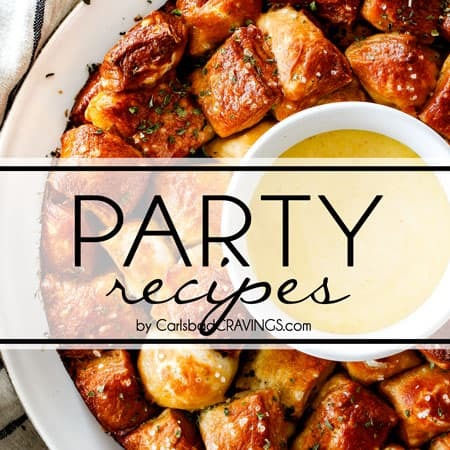 The adobo sauce they are preserved in is also highly flavorful, composed of various spices such as paprika, oregano, and garlic as well as vinegar, onion and tomato which all enhance the taste of the chipotle peppers. How do I store Leftover Chipotle Peppers? 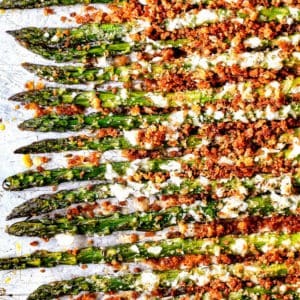 Most recipes only call for 1-2 tablespoon of minced chipotle peppers and so you are left with an open can of smoky, spicy goodness. I love spice, but that is a lot of chipotle peppers to use up before their fridge life expires! To make the most of your worthy investment, I suggest storing the chipotle peppers in the freezer. Spread saran wrap out on either a small baking tray, plate, or ice tray that will fit into your freezer. Separate the chipotle peppers from the adobo sauce and mince the peppers, (or you can use a food processor). Plop minced peppers onto the saran wrap in 1 tablespoon increments a few inches apart (if using an ice tray, place them in each ice cube compartment on the saran wrap). 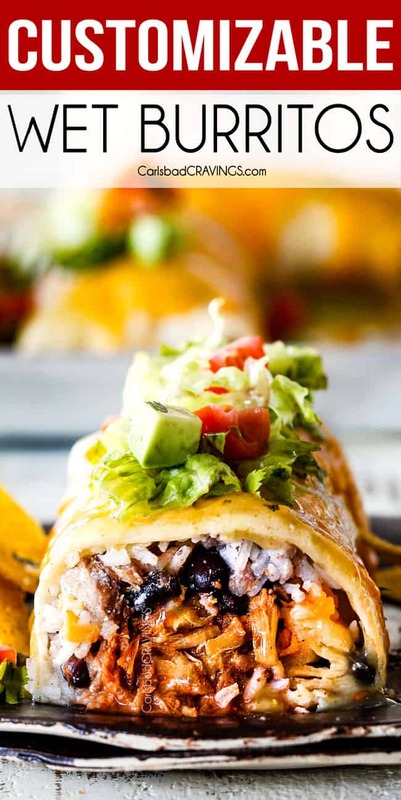 Put the tray in the freezer and when the chipotles are frozen, cut the saran wrap apart, individually wrap each tablespoon, and find your chipotles a new home in your freezer. It only takes a few minutes and then you always have chipotle peppers on hand and don’t have to stress about them going bad in your fridge. Win, win! Chicken substitute. You can substitute shrimp with chopped chicken and cook a few minutes longer until completely cooked through. Use defrosted shrimp. The tip to make this quick and easy is to buy deveined and peeled shrimp that are ready to be cooked. If the shrimp are frozen then follow my instructions above on how to defrost. 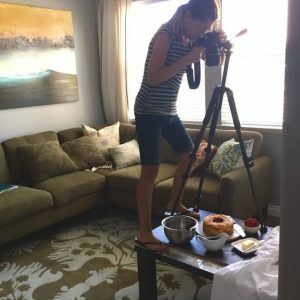 You don’t have to make a bowl! This shrimp is fabulous on salads, in wraps, burritos, tacos, etc. 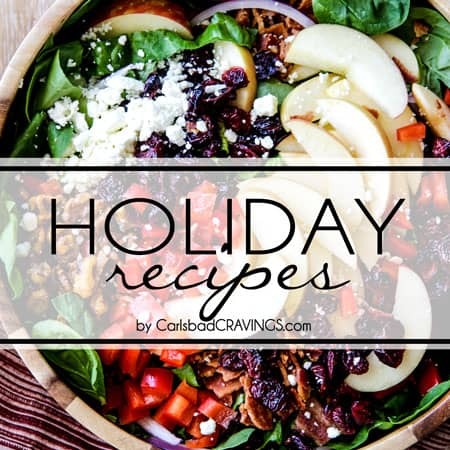 with your favorite fixin’s. Customize heat. 1 1/2 chipotle chile peppers should be perfect for most people but if you know you love spicy then definitely use 2 peppers. If you know you DON’T like heat then only use 1 chipotle chile pepper (or even less). Prep ahead: You can chop your tomatoes, cilantro, green onions and any other burrito fixings ahead of time and store in air-tight containers in your refrigerator. You can make your Cilantro Lime Dressing and rice ahead of time and refrigerate then warm rice when ready to use. Cilantro Lime Dressing Substitute: I am obsessed with my Cilantro Lime Dressing but if you don’t have the ingredients or don’t want to make it, make sure to add something creamy in it’s place to marry all the textures come together. 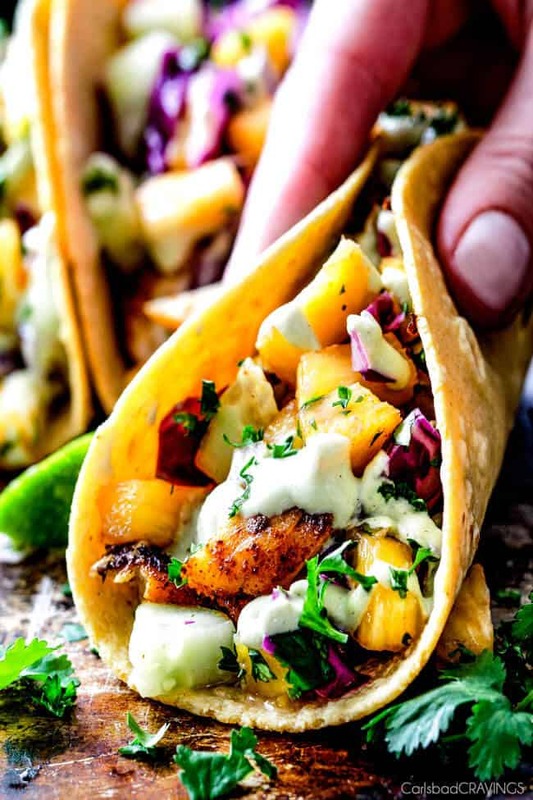 You could simply use sour cream or Greek yogurt or store bought (Greek Yogurt) Avocado Ranch Dressing or whip up a simple, heavenly Avocado Crema like I use in my Chili Lime Chicken Tacos. Want to try this Shrimp Burrito Bowl Recipe? 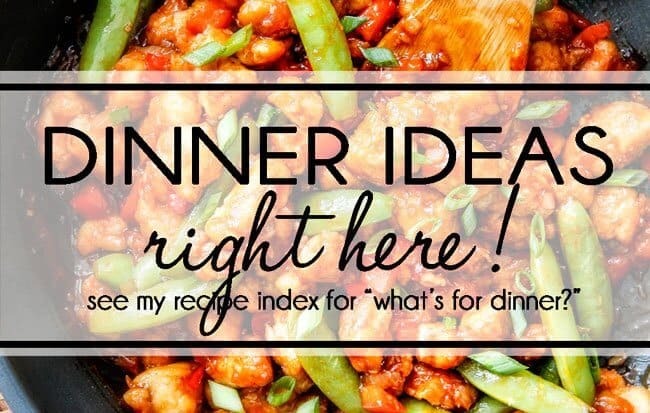 Pin it to your SALAD, CONDIMENTS or MEXICAN Board to SAVE for later! 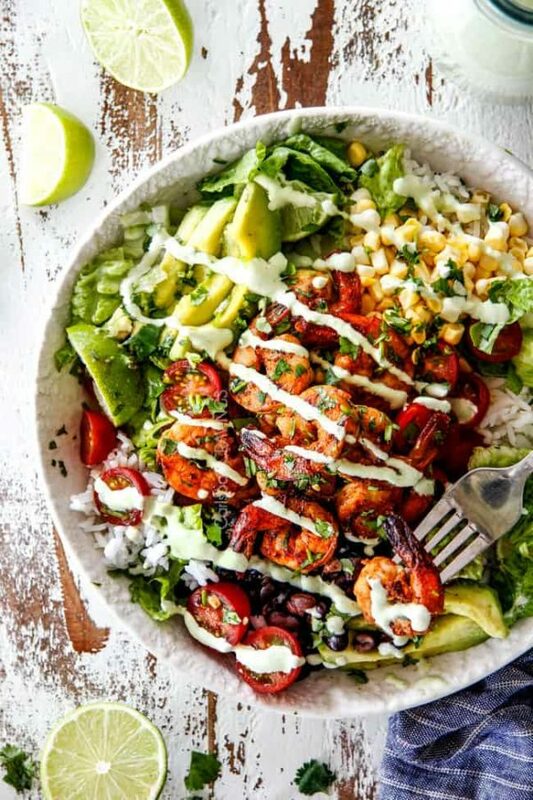 30-minute Chipotle Lime Shrimp Burrito Bowls are a walk-in-the-door-last-minute-meal that is healthy, quick and easy but PACKED with flavor. 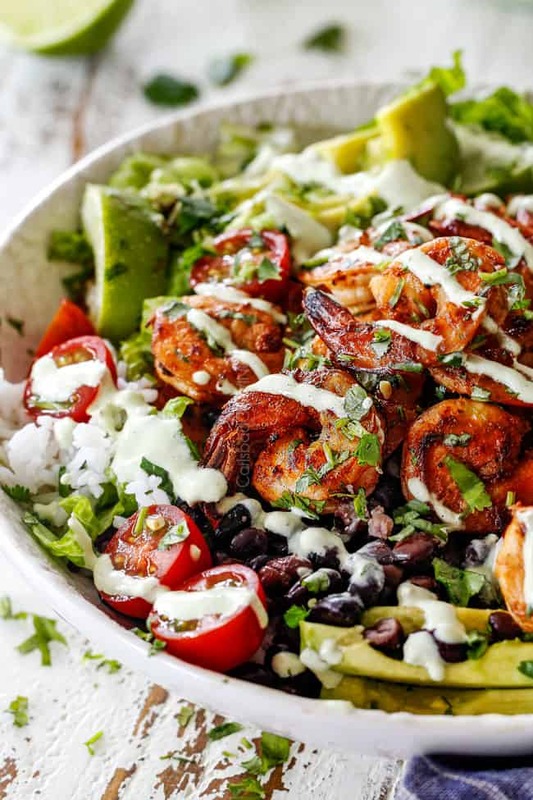 These Burrito Bowls are loaded with juicy, spicy shrimp, tomatoes, avocados, black beans, corn and rice, then drizzled with tantalizing Cilantro Lime Dressing. You can serve the Chipotle Shrimp as suggested Burrito Bowls are transform them into a salad, wrap or burritos! Stir together 2 tablespoons of oil and all remaining “Shrimp” ingredients in a freezer size plastic bag or an airtight container. Add shrimp, seal tightly and turn to coat. Let the shrimp rest on the counter for 15 minutes. Heat a large stainless steel pan over medium-high heat. Add the remaining 2 teaspoons of olive oil to the pan and swirl to coat. Add shrimp in a single layer and discard any remaining marinade. Let shrimp cook for 2 minutes then then turn over and cook an additional 1 minute or until they’re pink. Increase the heat to high for 30-60 seconds to slightly reduce any liquids. Remove shrimp from the pan when they’re finished cooking. Divide rice between 4 bowls and top with shrimp and other desired Burrito Bowl ingredients. 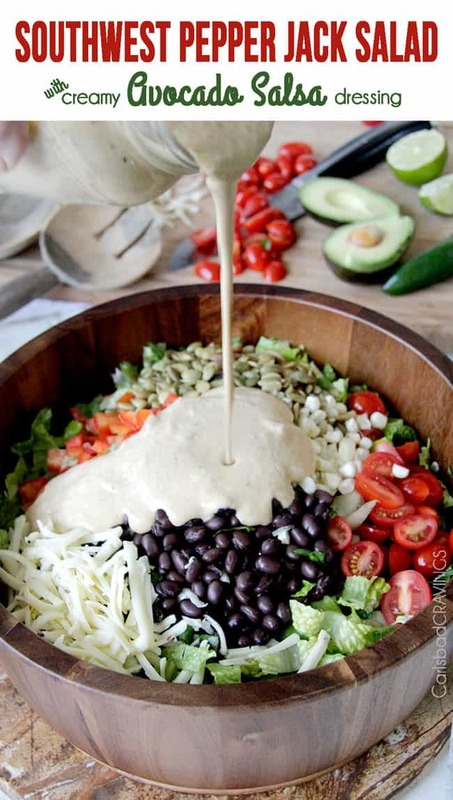 Drizzle with Cilantro Lime Dressing. Shrimp can also be served on top of a salad or in wraps. 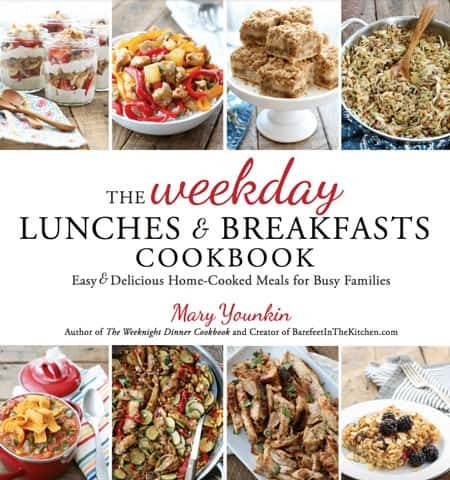 Recipe From The Weekday Lunches & Breakfast Cookbook by Mary Younkin with slightly adapted directions. You may have made a bit of a typo in recipe description, “You can serve the Chipotle Shrimp as suggested Burrito Bowls “are” transform them into a salad, wrap or burritos!” You meant “or” transform them, right? Anyhow, enough of that! This is just the recipe I was looking for! Your site has become my “go to” site for restaurant quality meals. You should be proud! You are my favorite chef. yes, thank you for catching that and thank you for your kind words!!! I am honored I am your go-to site for “restaurant quality meals!” Thanks for all your awesome comments and for always making me smile! Oh.my.goodness was this yummy!! I made this tonight with the Cilantro Lime Dressing (which, by the way, I could eat by the gallon!) and my husband was floored by how good it was. I’ve made several of your recipes and not one has failed me. 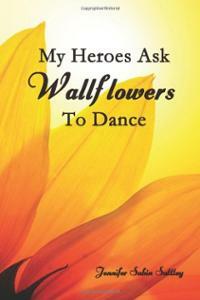 Seriously, you could tell me to pick crickets from the yard and sauté them and I’d go right along! 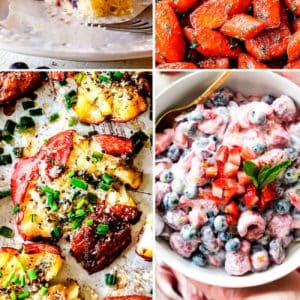 Thank you for posting such amazing recipes!! LOL! Crickets it is 🙂 Thank you so much Lindsey for your awesome comment! I LOVE hearing how much you loved these burrito bowls and and my other recipes! Thanks for keeping my job fun! OMG! This was incredible. So scrumptious! And that sauce…. I could just drink it! Bless you! Ah, thank you Vanessa! I’m so pleased you loved it!